It may not be a real diver but what a gorgeous watch it is! 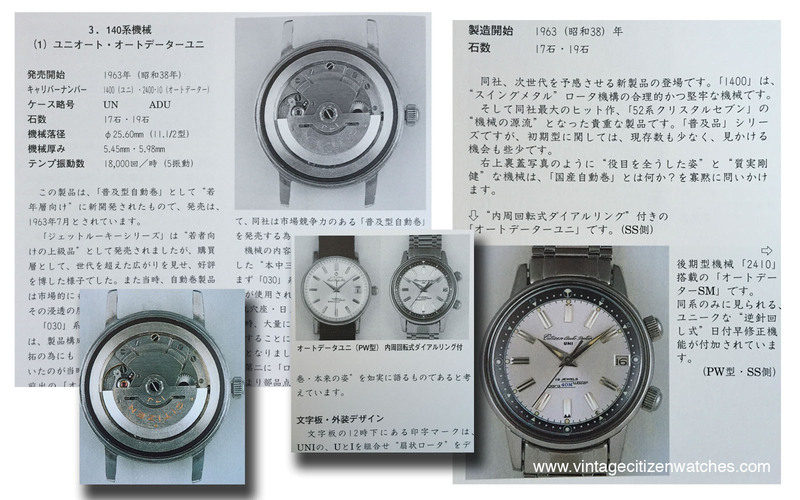 It was made in 1964, just 5 years after the introduction of the first Japanese water resistant watch, the Parawater, and about one year prior to the first real diving watch made by Citizen. The main feature of the watch is the fact that it is a twin crown, similar in appearance with a compressor. The upper crown, located at 2 o’clock, operates the inner bidirectional rotating bezel. By contrast, the lower crown located at 4 o’clock winds the movement and sets the time. The case is made entirely in polished stainless steel and measures about 38mm. The Tropic strap is 18mm at the lugs end and is secured in place by pins that can be easily removed due to the holes in the lugs (a feature that I like a lot in vintage watches). The domed acrylic crystal protects the beautiful face. The dial is silver, having a sunburst effect. The doubled hour markers are polished and applied. The black elegant lettering are printed and so is the “40M” blue para water feature. The dauphine hands are polished and the hour and minute one have a central luminous part. The inner black rotating bezel has white printing and luminous material markers. On the dial itself the hours are marked with luminous dots too; all except the one at 3 where the date is. The date window has no frame but instead a beveled edge. The dates are printed in black on a white date wheel. 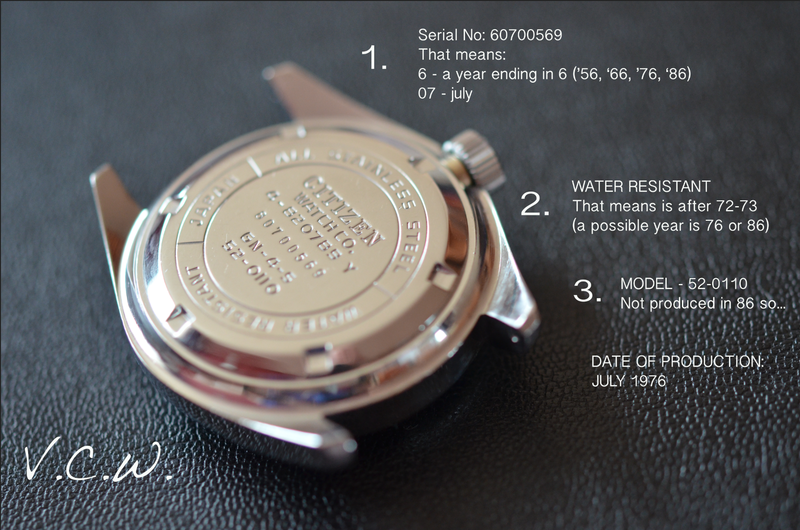 The snap in case back is engraved “Para water, Star, SS, Citizen auto Dater, UNI, ADUS31201-T” and the serial no. Strangely Citizen decided to mark them with the production date and so did they do it on older ones but not on their first divers. 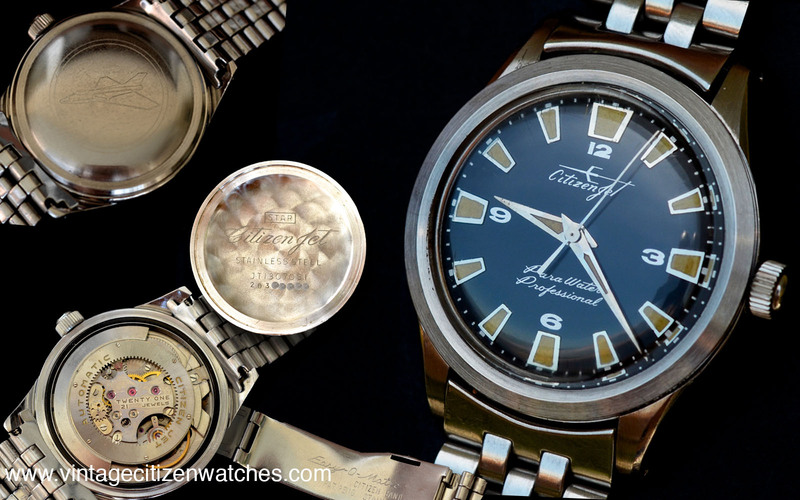 😦 I wish I could say for sure when the first real diver made by Citizen was manufactured. 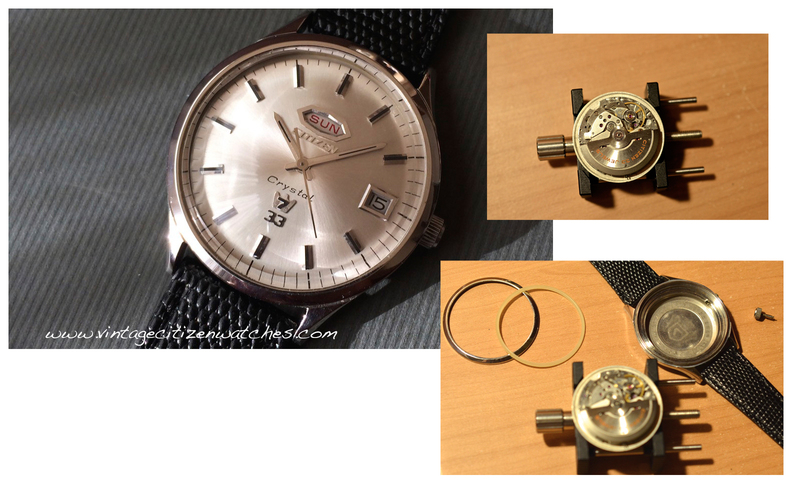 Under the case back we have the automatic (hand winding also possible) Citizen 19 jewels movement, cal 2400. 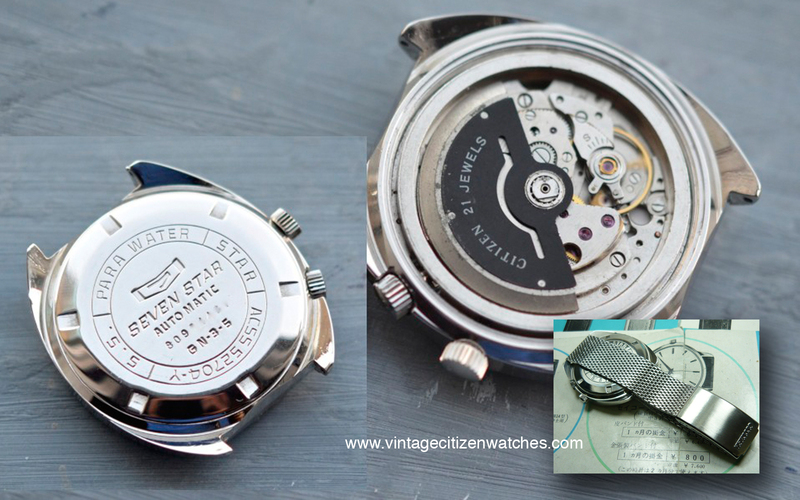 In the early till mid 1960’s Citizen used its own circular geared rotor (Jet rotor movements) in its automatic watches. In 1963 they began replacing the Jet rotor with the more common oscillating weight, which, some say it was cheaper to manufacture and more easily to service than the Jet rotor. 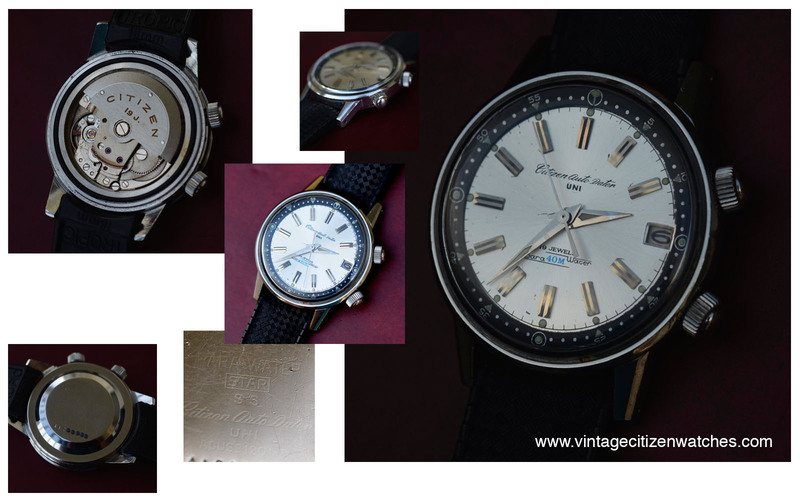 The first model to use the swinging weight was known as the “Uniauto” (cal 1200) and came in several versions, all with a special logo on the dial and in 17 or 19 jeweled versions. This watch, presented here, has the logo on the inner bezel at 12. It works at 18,000bph. The date changes by advancing the hour hand past midnight. The seconds hand do not hack. Still I have to find out why is it called “UNI”? 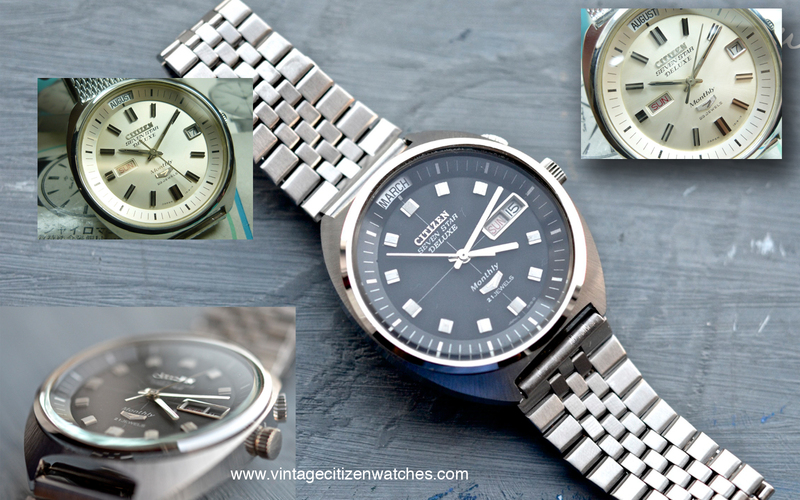 Read more about a different diver compressor style vintage Citizen here. This is a nice full calendar Citizen, powered by a simple movement. Even though it looks like the month display is a complex feature, it is only a simple and clever internal bezel. Due to this particularity (month display) it was named “Monthly” but another similar model is called “Moon – Dater”. The reason for a this (one model with two names) is the fact that the “Moon -Dater” might have been designated for export. The dial is dark deep black, without reflections. The white one is as in the pictures. I didn’t have the chance to hold it and take a closer look. The hour markers are applied and polished. The “7” logo and the “Citizen” logo are applied in a similar manner. In the same way the hands and the day-date window frame are also polished. 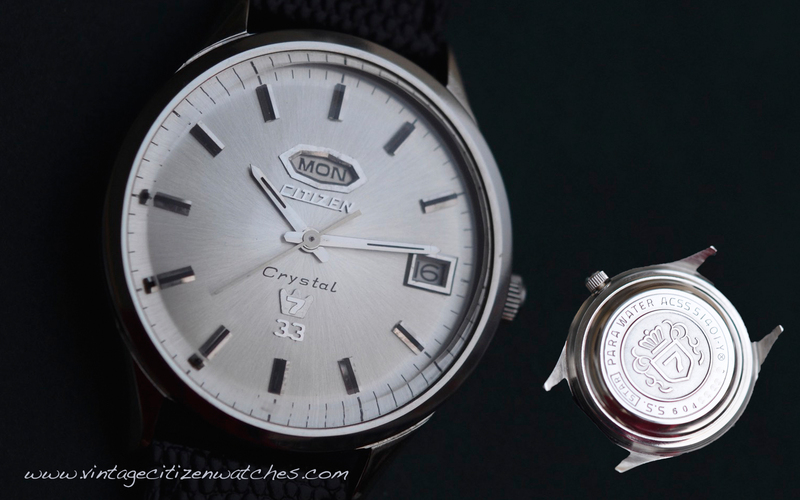 There is a second part of the dial, a raised internal minute disk that features the month window. All the disks (day, date , month) are white with black lettering (sundays are red). For the white dialed one the day is positioned at 9. There is also a version with a pink month disk (the Moon Dater?) I like the crosshair detail and the white lettering resembling white chalk writing on a blackboard on the black one. The movement is the automatic Citizen calibre 5270, with 21 jewels beating at 18,000 beat per hour, with quickset date. Some models have a 23 jewels movement. It is a reliable movement used in a variety of models displaying day and date. It offers hand winding possibility too. The date changes in the second position of the winding crown (first position for winding, third for time setting) but the day changes only by passing midnight with the hands. The operating crown for the movement is the one at 3. Even though it seams that the month display is operated by the movement, it does not. In fact it is an internal bezel that should be adjusted by the crown at 2 o’clock. The bracelet for the black one (nor sure if it is the proper one for the model) is tapering and closing with a signed clasp. The interesting part of the signature is the fact that is longitudinally placed along the clasp. Not too much to say about it, only a brushed bracelet that in my opinion suits the watch very well.The white one is on a mesh bracelet (not sure if original for the model). All things considered, this is a simple, interesting watch, with a clever way of displaying the month. So, here we have a full calendar vintage Citizen.